223 Remington is one of the most loved rounds in the world. Due to its excellent ballistics, light weight, light recoil, and accuracy, this round is ideal for several different shooting applications such as hunting, pest control, range and match shooting, and self defense. 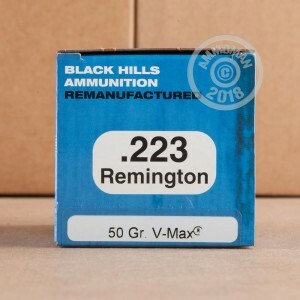 Black Hills re-manufactured ammunition is a great choice to run through your favorite 223 Rem firearm. Once you pop these beauties in your rifle, you can enjoy the quality of BHA without a steep price tag. Black Hills knows that you count on them for premium ammunition, and that's why they decided to put Hornady's top notch 50 grain V-Max bullets in these rounds. 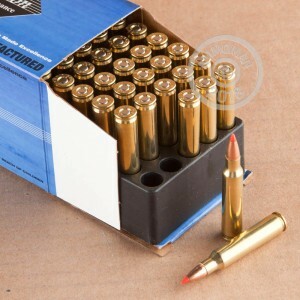 Designed for varmint hunting, these re-manufactured rounds are fantastic for eliminating the pesky creatures around your home. Don't forget, at AmmoMan.com all orders over $99 will ship for FREE! So stock up and save!